Canon is really making waves in the professional motion picture world. They have the manufacturing breadth and experience to produce some really high quality products. Professionals have been a bit slow to adopt the new system of cinema cameras and lenses – but it looks like things are picking up. …way up. In a recent press release, Canon discusses their products being used on an upcoming IMAX film. Check out the press release below. MELVILLE, N.Y., September 22, 2014 – Canon U.S.A. Inc., a leader in digital imaging solutions, is proud to announce that Canon Cinema EOS digital cameras and lenses have been selected by IMAX Corporation for an exciting mission to capture 4K footage in space. 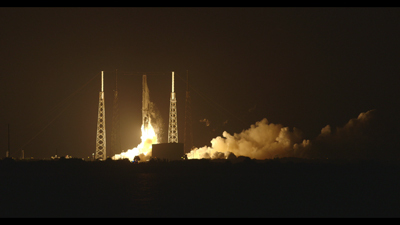 The cameras and lenses left Earth Saturday on a SpaceX Dragon spacecraft launched from the Cape Canaveral Air Force Station in Florida. The equipment will arrive at the International Space Station, where astronauts will capture stunning 4K content for the upcoming new 3D film, tentatively titled A Perfect Planet, a presentation of Walt Disney Studios Motion Pictures and IMAX Entertainment. Directed by acclaimed filmmaker Toni Myers, the IMAX 3D space project will offer breathtaking, illuminating views of Earth from space, exploring mankind’s future on and off the planet. Renowned large format cinematographer James Neihouse serves as the film’s director of photography and trained the astronauts who will man the cameras while in orbit. The IMAX production team selected Canon EOS C500 EF digital cinema cameras, Canon EOS 1D-C digital SLR cameras, and a selection of Canon Cinema Zoom and Prime lenses for the project. The EOS C500s will be paired with Codex recorders to capture 4K images. “I am thrilled that the Canon Cinema EOS cameras we have selected launched to the International Space Station and our astronaut crews can now begin filming spectacular scenes for our new project,” said Toni Myers, who will produce, direct, write and edit the documentary film. “The lightweight, flexible Canon cameras produce remarkable imagery and are ideal for capturing scenes of our beautiful Planet Earth. “When we launched the Cinema EOS product line, Canon hoped to inspire filmmakers to take their craft to new heights. We are honored that IMAX, Toni Myers, James Neihouse, and the astronauts took our challenge so literally. To have our cameras and lenses travel to space is an incredible cause for celebration. We look forward to this awe-inspiring film and pledge to continue to engineer products worthy of the next frontier-whether here on Earth or among the stars,” said Yuichi Ishizuka, president and COO, Canon U.S.A., Inc.
IMAX’s 3D film will be shot over the course of the next year with multiple crews of astronauts conducting principal photography. The film is tentatively set for release in early 2016. Be interested to know what other cameras they tested to claim the 500 looked more filmic in comparison. My first assumption for using Canon would merely be it’s amazing low light capability and size.